That's the title of this interesting post by my son, Phil. Curiously, in the Revised Common Lectionary this Old Testament passage is paired in the gospels with John 1:10-18, which includes the verse about how when the Word of God was made flesh, he came to this world “full of grace and truth.” As noted in the set of sermon starters on that passage, we rarely find that tenacious combination of grace AND truth on display in other people (or even in our own selves). In our “Either/Or” mentality we too often opt to be either gracious (and so we bend or elide the truth) or we tend to be truthful (even if telling the truth or standing up for the truth leads to behavior that is downright ungracious). Similarly in Jeremiah 31: we have a hard time believing that the same prophet who had been hammering away in judgment against the people of Judah could also—and pretty much at the same time—point forward hopefully to a day of promised blessings even greater than what the people had known before. What may be even more striking is the idea that somehow the blessings of all that restoration would emerge from the midst of all the sorrows Jeremiah had been talking about all along. In fact, this lection stops one verse short of the well-known verse about Rachel weeping at Ramah for her lost children. Jeremiah does not deny for one moment the presence of weeping and sorrow in this world but somehow knows that if a word of restoration and hope is going to be spoken at all, it needs to be spoken into precisely those contexts of raw and jagged realities. This BBC report tells about one-man's fifty-year plus project, undertaken after being expelled from a monastery for contracting tuberculosis. The story appealed to me in several ways. Justo Gallego, the builder of a church building made of junk, who has no training in art or architecture, wanted to glorify Christ even though he could no longer be a monk. But before dismissing Gallego's church structure, consider some of the things this fifty-year effort may tell us about the life of faith and about Christ Himself. Fifty-plus years ago, massive vaccination against TB had not begun in so-called developed countries, though there were treatment facilities that had some success. My mother, just a few years younger than Gallego, contracted the disease and spent some time at the Franklin County Tuberculosis Sanitorium in Columbus, when she was young. Maybe the monastery lacked the capacity to care for Gallego as the sanitorium did for my mom. But his dismissal will do as a metaphor for what the institutional church sometimes does with those it doesn't know how to handle. I myself have often experienced the institutional church as an organization peopled by gatekeepers whose function seems to be to tell people, "No." No, your service is not needed. No, you can't try to get that ministry started. No, you can't ask people for money to build that building. When I was the pastor of a start-up congregation in the Cincinnati area, at least four times, our fledgling church hit goals for membership, giving, and worship attendance we were told would bring us a loan from our denomination to build our first facility, only to be told, "No" every time. The last time occurred after we'd had a capital campaign that raised precisely what our denominational officials told us we needed to raise. Our building committee, flush with excitement over the successful campaign, was shot down on lift-off by the denominational official with whom we met. "If you think you're going to build a church now," he told us, "you're smoking something funny." He wasn't done. "You're not the first ones to make a mistake like this, folks," he told us. "I make many mistakes," I finally said, "but this was not a mistake. We did exactly what you told us to do and now, you're saying that we can't forge ahead." That night, we decided to forgo the "No" of the gatekeepers and, with the empowerment of God, erected the church's first building unit...after fourteen years of worshiping in a school gym. We found commercial lenders more excited about what we were doing as a church than our own denominational gatekeepers were. You can't stop glorifying Christ, the Way, and the Truth, and the Life, the lifeline to God almighty, just because people with institutional power say, "No." Justo Gallego has lived that truth! And how about the practicality of Gallego's structure? Is it necessary? Certainly, there are other churches in the Madrid suburbs, where he's built this building. And, who's to say that a Mass will ever be said there? If the building is extravagantly unnecessary, then it is in good company. You see, that's exactly how I think of God's love for the whole human race. Extravagantly unnecessary. Richly superfluous. Often, when I discuss Genesis 3, which recounts the fall of Adam and Eve into sin, people get (understandably) hung up on questions like: Why did God allow the tree of the knowledge of good and evil or the serpent to be in the garden of Eden in the first place? Where did the serpent come from? Is the serpent the same as the devil? They're all good questions which we might take up with God some day. But to me, the most baffling question is this: Why didn't God give up the whole idea of creation as a bad project right then and there? His most beloved creatures--the only ones created in His image--turned on Him and so, consigned the whole creation to centuries of groaning under the weight of their sin. When I was a kid, playing with clay, and didn't like what had become of my creation, I smashed it and maybe, I'd start over again or, likely as not, put it away and move onto the next thing. God didn't move onto the next thing! He kept His focus. He keeps it still. For God only knows how many centuries, He has been focused on one thing: Bringing the lost home. Being reconciled to the rebel human race. God hasn't done this by forcing our return or coercing a forced reconciliation. He's been patient. He let one group of people in on His plan so that they could be a light to the nations until the moment was right. Then, the one light who is life to all people showed up to live among us. Of course, being human and thick of head and thick of heart, we didn't recognize the Light when we saw Him. God blanketed the human race and the whole universe, in fact, with His extravagant love and all we could think to do was kill it. So we did. On a bad Friday we now recognize as good, we killed the Giver of life. But God wasn't done loving us yet. Christ, the Light of the world, rose from the dead. His love is available to all who dare to turn from sin and turn to Him in trust. God's extravagantly unnecessary love turns us from God's enemies to God's friends. Hey, big britches, Paul was saying, the world considered you junk. God loved you anyway. Died for you. Rose for you. In Christ, God turned what the world calls junk into gold. Don't start acting like junk! If you don't understand everything in that passage, don't worry about it now. Take this away from it: God's extravagantly unnecessary love can come to live inside you, no matter how broken or filled with sin you may feel you are...or may actually be. And here's the thing: God's love is a real extravagance. He's got plenty more where that came from. God's got so much love for us, in fact, that those of us who get it, can give it away and still not lose any of it. 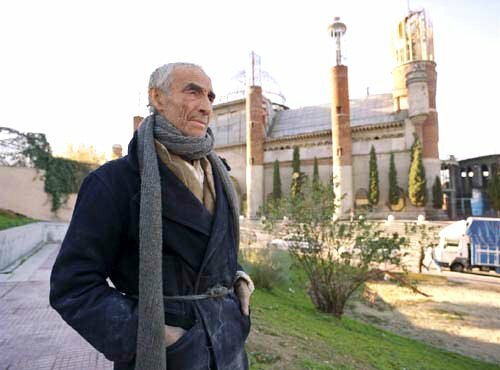 When God's love comes to live in what the world calls "junk," the junk, like Justo Gallego's useless church building, can be a beautiful testimony to the greatness and grace of God. I want my life to be that kind of testimony. It doesn’t sound like a church name … on purpose. We really want to connect with people who have no interest in “church” by society’s definition. There are plenty of churches for “normal people” and we think we have a unique calling to reach out to our otherwise unreached friends. Our name is integral to that process. Whether outcast by society (e.g., punks, skaters, ravers, homeless people…) or by the church itself, many who come can identify with the name “Scum of the Earth” since they have been previously treated as such. More important to us, however, the name implies that being people of faith does not mean we are better than anyone else. We know many non-Christians who think Christians are out to cast judgment on them. Our name makes it clear that we aren’t about that. We are just aware of our need for God, as Scum of the Earth. Fortunately, God never sees us like that! But the name is humble and we like that. For all I know, Justo Gallego may be certifiably looney. He may have wasted the past fifty years. And Scum of the Earth Church may be a collection of crazy people. But I want to waste my life glorifying Christ in whatever ways I can. I want to do it out of gratitude for the God Who "wasted" His extravagantly unnecessary love--His body, His blood, His grace--on me. I want to do it so that, in the end, none of that extravagantly unnecessary love is wasted, but accomplishes all it can do when God spends it on me...and you. Puerile came up in my s....l....o.....w reading of Frank Freidel's one-volume biography of Franklin Roosevelt, A Rendezvous with Destiny. Freidel describes the controversy which attended Roosevelt's attempts to raise farm prices through the doubtful ploy of buying gold above the prevailing price on the market, hoping that doing so would decrease the value of the dollar and so, make it easier for for other countries to purchase American goods, including crops. Many "financiers, economists, and politicians" expressed disapproval of the scheme. Former FDR ally--by then, bitter enemy--Al Smith labeled the "commodity dollar," as it was being touted, the "baloney dollar." Roosevelt fired the under secretary of the Treasury, Dean Acheson, later to be Harry Truman's Secretary of State, because of Acheson's disagreement with FDR on the plan. Also, John Maynard Keynes, godfather of deficit spending as a means of stimulating economic activity in depressed conditions, whose name is often associated with Roosevelt's approach to the Great Depression, weighed in opposing the Roosevelt gold purchases. Keynes, Freidel says, "in an open letter to Roosevelt that appeared in the New York Times at the end of the year, scoffed at the scheme as puerile...[and] irreverently remarked that the fluctuations seemed more like 'a gold standard on booze than the ideal managed currency of my dreams.'" Puerile, boozey, or not, FDR continued the gold buying into January of 1934. "The results were disappointing, bearing out neither Roosevelt's expectations nor those of his critics," Freidel says. And isn't is that always the way things go? Nobody has a lock on wisdom. Rarely is anybody utterly vindicated for having vision; everyone gets left with a little bragging rights. Most agricultural commodities slipped as a result of Roosevelt's gold buyouts. The lone exception was wheat. As Freidel tells it, Roosevelt's action was a short-term economic non-starter. But it may have bought Roosevelt and the country some time, preventing a second economic collapse. So, was Roosevelt's gold-buying puerile or was it mature economic thinking? That's a matter of debate. But the answer seems to be somewhere between Roosevelt's sunny assertions of its efficacy and his opponents' belief that it was destructive at worst and irrelevant at best. But the meaning of puerile is none of the above. This piece asks readers to look back on the previous year for major events in their personal lives. Six months ago today, I went to Riverside Methodist Hospital in Columbus to undergo a heart catheter procedure. Sixteen days earlier, I'd had a "silent" heart attack, felt but undiagnosed. Twelve days later, my doctor seeking to eliminate possibilities, an echocardiogram was done. It was discovered that I'd had a major heart attack that damaged 40% of my heart. I was to do nothing until the catheter procedure the following Monday, the doctor told me. This was Thursday. If I had any chest pain, I was to get to the nearest emergency room ASAP. But I have to confess that during the hour-long drive to Riverside from our house on the day of the procedure, I felt utterly calm. This is how I really felt: Whether I lived or died, I was in the hands of God. I'm sure that I've written about the procedure before. But it was an amazing experience. I was awake throughout, talking with the doctor and OR personnel the entire time. A 100% blockage was discovered in one of my arteries. The plaque material was recent enough--and therefore, soft enough--for the doctor to be able to push a stent through and I was released the next morning. As I think I've explained before, when I arrived at the hospital, my ejection fraction, a number which measures the efficiency with which the heart is doing its job, was at 25. That's ten points below what's considered dangerous. No person's EF is 100% and average is about 65%. So, I had been sicker than I realized, probably for longer than I realized. Medical personnel have expressed bafflement at two things. First: They can't understand why I had a heart attack. No relevant family history of heart disease. Great blood pressure. Good cholesterol readings. Not overweight. Exercised thirty minutes a day. Second: They can't understand how I survived the heart attack I had. Their bafflement has to do with the location of the blockage. "There is no medical way to explain why you're still alive," a cardiac nurse told me. And that eternal life begins here and now--in hospital surgical suites and waiting rooms, in the places we live every day. The Savior Who took on flesh, Whose birth among us we are celebrating this Christmas season, has shared in our messy lives, invited us to own the blame for His undeserved execution on a cross, and commanded us to follow Him. Eternity belongs to those who dare to be honest with the God who dared everything to win us back death and sin and evil. Six months ago today, that all became more real to me than it ever was before. And Christ--His love, His power, His grace, His righteousness, His willingness to destroy the sin I daily lay at His feet--all those things are more real to me today than the desk at which I set. I've met the King and I'm intent on serving Him alone. He saved me for this, not just six months ago, but at the very moment He first saved me, on that cross two thousand years ago. is contumely. It's one that I run across infrequently in my reading, which is probably why I have to go to the dictionary again every time I read it. Maybe posting this will finally imprint it on my brain. because of global warming. I think I understand. "...the biggest thing is that we're not scared about leaving the house"
The words are those of a Pakistani woman talking about being able to work at a fast food restaurant. Interesting. Christmas was just yesterday. Yet our Gospel lesson for this morning fast forwards us to events that happened two years and more after the birth of Jesus. In spite of the confusion that it might cause us though, I think it’s good for us to come to this lesson immediately following Christmas day. Through the centuries, our Christmas celebrations have been loaded down with what I can only describe as sentimental lies or pleasant sounding truth-blockers. Jesus, when acknowledged at all in most contemporary celebrations, is turned into a harmless little baby. But Jesus was not and is not harmless. Herod knew that. The wise men did too. They knew what we must know: Christmas is D-Day! Christmas is God storming the beaches of our resistant lives and wills. In the name of the same freedom the serpent told Eve she would have if she disobeyed God, a freedom that ends in slavery to sin and death and futility, we willingly buckle under the authority of an evil, morally compromising world. At Christmas, God entered our world to upend that reality. Christmas is God coming to overthrow the illegitimate occupier of power in our world, the devil himself. Christmas is a just God come to overturn the tables of extortionists, to strip the selfish of their power, to put the violent and unjust in their places, and to bring life to those who, contrary to what the world tells us to do, repent for our sin and surrender our whole lives only to Him. The bottom line is that the sweet baby Jesus is a threat to the standard operating procedures of the world, maybe even of our own standard operating procedures. In the New Testament book of Acts, it was said of the first Christians that they had turned the world upside down. Filled with faith in Christ and with God's Holy Spirit, they were empowered by God to continue the mission of Jesus, each believer in Jesus an outpost of the kingdom that destroys all the powers of this world. Jesus Himself was such a threat to the king of Judea, that, to protect Jesus, He and His earthly parents became refugees in Egypt. Keep in mind the threat that Jesus represents to all the selfishness and injustice that exists in our world as we delve into today’s Gospel lesson. Please pull the Celebrate inserts from your bulletins and find it on page three. There are several things to notice here. First: Herod, we’re told, wanted to “destroy” the child. The verb in the original Greek is part of the same verb family used much later in Matthew’s gospel to describe what the religious leaders in Jerusalem conspired to do to Jesus. Herod loved power and personal comfort. Over his lifetime he had been willing to do anything to retain his power, including the killing of a wife whom he adored, but who, he was convinced, was plotting to take power from him. Herod was so selfish that, when he was dying, he ordered that the leading citizens of the town of Jericho be murdered to ensure that people would be crying during his funeral. The fact that the same word--destroy--was later used by Matthew to describe what the religious leaders—the priests and the levites—plotted to do to Jesus demonstrates what a threat Jesus can be not just to the rich or to those in government, but also to those who exercise religious power. Jesus, in fact, is a threat to all who delude themselves with the idea that we human beings are self-sufficient and don’t need a Savior for a crutch. A woman in my former parish told me that she got angry with people who dismissed her faith in Christ as “a crutch.” Her anger wasn’t born of a belief in her ability to conquer any mountain in life. “Of course Christ is a crutch,” she said, “I need a crutch. That’s why I’m a Christian.” Jesus Christ, Who bore the weight of all our sin on the cross and then rose again to life, is the only crutch we can find that won’t buckle under the pressure of all our personal sins, our stresses, our difficulties, our daily challenges. I've often thought since that woman shared her insight with me that we Christians ought to wear lapel pins portraying a crutch in order to openly declare our total dependence on Christ! Notice a second thing in these first verses of our lesson, something we see throughout the passage: Joseph did not hesitate. As soon as he was told to take the child and his mother to Egypt, he did so. He apparently took action on the very night he had his dream. If I had been Joseph, I might have hesitated. I might even have simply ditched Jesus and Mary. After all, Joseph had no genetic connection to Jesus. Joseph could have turned Jesus and Mary over to the authorities and maybe lived a comfortable life in the employ of Herod and his descendants. He certainly could have spared himself the grief of being connected with a baby who was already a fugitive. But Joseph opted to share the danger that the toddler Jesus faced. Joseph chose to obey God…immediately! Faith that doesn’t result in obedience to God, to the extent that you and I are able to understand God’s will and obey, isn’t faith; it’s just an idea. Wherever the call of the God we know in Jesus, sends us, that’s where we’re to go. That’s what faith does. Herod was taking no chances. He enjoyed his comforts and perks too much to allow a competitor for his throne to threaten him. This intolerance of other contenders for positions of privilege still goes on, and not just in the counsels of the national governments and big corporations. It even happens in churches. I read once about a man who held a place of prominence in the church he attended, a large congregation in a small Texas town. People bowed and scraped to him and didn’t call him directly by his first name. He was Mister John. No decision was taken in that church without Mister John first giving his approval. A young pastor arrived, who, naïve enough to believe in the Bible's teaching that all believers are ministers, treated John with the same respect he showed all people, but not with deference. John wasn’t on the church council; so, the pastor didn’t know he was supposed to run things by John before bringing them before council. Mister John tried to correct the young pastor, but the pastor seemed insusceptible to any authority but God’s authority, as expressed in the Scriptures. No one knows how they got started for sure, but after awhile, rumors started being noised around the church and community: rumors about the pastor and his relationships with other people, rumors about church finances, rumors about the church’s decision making process, all false. Nonetheless, the pastor was forced from ministry altogether. Most people in the church had no idea what had happened. But Mister John did, which is why, to his credit, decades later, he found that pastor and his wife living in another town and apologized to the pastor. But much damage had been done, the same damage always done by those who are threatened by Jesus’ authority supplanting their own. In the last verses of our lesson, Herod has died and Joseph, once again, is told in a dream to head out, this time away from Egypt and now, to Nazareth. To me, this may have been the hardest of all the orders Joseph received from God. By the time Joseph received it, he and his fledgling family had put roots down in Egypt. Anyone who has ever worked for a large corporation, been in the military, been in ministry, or grabbed a new opportunity in a different community, will know how hard it is for a young family to move to new places. The reasons for staying always seem to outweigh the reasons for leaving. But Joseph took his family to Galilee immediately. The thought of keeping the life to which he’d grown accustomed seems never to have crossed his mind. For followers of Jesus, he status quo will never do; only Jesus will do! And that brings us back to this. Christmas reminds us that Jesus and those who dare to follow Him are threats to this world. When you understand that Jesus is the way, and the truth, and the life, the only means of being reconciled to the only One Who can give us life, all other ways, all other supposed truths, and every other way of life must be abandoned. This is hard; but, God has revealed, it’s the only way to truly live. When I was a senior in high school, I asked a girl out on a date. She said, “Yes,” but later backed out. I was baffled. (I mean, I was real charmer back then. Right, Ann?) During the rest of the school year, she would speak to me, but in little more than grunts. When our yearbooks were delivered, I emboldened myself to ask her to sign mine. “You really are a nice guy,” she wrote. “But you have to quit worrying about what people think of you.” It took me years to figure out what she meant. And it took Jesus to begin to liberate me from the tyranny of other people’s opinions. There is only one person Whose opinion of you and me matters, and that’s the God we know in Jesus Christ. He has expressed His opinion of us in the suffering, blood, and cross of Jesus. This Christmas, let Jesus storm the beaches of your will and heart. Let Him assault and destroy the sin in you through a life style of daily repentance and renewal in His Name. Let Jesus be all that matters to you. None of that is likely to win you a popularity contest. And letting Jesus be first in our lives won’t earn us places of comfort and ease. On this holy night, I want to ask you to do something really revolutionary. In the racks in front of you, there’s a power plant with more energy in it—and certainly more truth and more life--than can be found in the whole physical universe combined. It’s called the Bible. I ask you to grab a Bible and turn to page 588. Go to Luke, chapter 2, verses 1 to 20. The translators who produced this edition of the Bible have titled the first seven of these verses, “Christ Born of Mary” and verses 8 through 20, “Glory to God in the Highest.” That little block of print is Luke’s entire God-inspired account of the first Christmas. Isn’t that stunning? In those twenty verses, Luke tells the whole story of Christmas! I think that’s especially striking when you think of all the embellishments we’ve added to the true Christmas story. There are no drummer boys. No midwives. No oxen. No donkeys. And no grandmas run over by a reindeer. And it came to pass in those days that a decree went out from Caesar Augustus that all the world should be registered. This census first took place while Quirinius was governing Syria. So all went to be registered, everyone to his own city. Joseph also went up from Galilee, out of the city of Nazareth, into Judea, to the city of David, which is called Bethlehem, because he was of the house and lineage of David, to be registered with Mary, his betrothed wife,[a who was with child. So it was, that while they were there, the days were completed for her to be delivered. And she brought forth her firstborn Son, and wrapped Him in swaddling cloths, and laid Him in a manger, because there was no room for them in the inn. Caesar Augustus was the adopted son of Julius Caesar. He had fought a long civil war to take control of Rome and turned it from a republic, in which at least some of its residents voted, to an empire in which he was the undisputed despot. Like many dictators, Augustus strengthened his rule with propaganda that touted his greatness. He declared his adopted father a god, which, of course, made Augustus, in his telling, the son of a god. He also claimed to have brought eternal peace to the earth. He commissioned elaborate tales about his birth, including signs and wonders pointing to his greatness. When this undisputed ruler of an enormous empire ordered a census, his kingdom hopped-to. In Judea, the land into which Jesus was to be born, thousands of people were forced to return to their ancestral homes in order to be counted. All this movement of people at the command of one man might very well make you think that that one man, Augustus, was extremely important and powerful. But what Luke wants you to see in the story of the first Christmas is a clash of kingdoms. There is the visible kingdom of Augustus with his armies, his navies, his power to tax, his power to push people around like so many pieces on a Checker board. Power like that today is wielded, you and I can see, not just by governments, but by media conglomerates, corporations, cartels, the inheritors of wealth, superstar celebrities, and others. But Luke wants us to understand that there is another, more powerful, kingdom at play in our world. It’s the invisible kingdom of God. Unlike the birth mythologies associated with the Roman emperor Augustus, when the kingdom of God entered our world, it was known only by a simple virgin girl, her carpenter husband, angels sent from heaven, and a few shepherds. Everybody else missed out! Through Luke’s simple narrative, God wants you to see that while God is the indisputable Creator and King of the universe, He doesn’t use the usual tools of the powerful to leverage your allegiance to Him, your belief in Him. God doesn’t push you into welcoming Him into your life. There is something to be learned from this by all of us tonight. If you look only at the visible things of this life—the kingdoms of this world—things like salaries and pensions, guns, tanks, and armies, hobbies and friendships, good health and success—to give you the peace announced to the shepherds by the angels, you will miss God and His kingdom. You’ll miss Jesus. Many of the thing visible things we see each day have their places. God made many of them and, as the old saying reminded us, God doesn’t make junk. (And that includes you!) But none of the things you and I can see, not even the beautiful things we may see in this sanctuary tonight, can bring us the life, peace, and hope that only Jesus brings to those who dare to pay heed to Him, who dare to follow Him! Luke tells us that on the night of Jesus’ birth, the only people willing to trust in Christ were some shepherds and two young people from a tiny town called Nazareth. To them, God’s kingdom and God’s Son were real. It’s to people like them—people willing to see and welcome Jesus—that faith still comes. In his book, Finding God in Unexpected Places, journalist Philip Yancey, tells the true story of an incident that happened at the inner-city Chicago church to which he, his wife, and several other well-off suburban professionals belonged. The church’s pastor had left, attendance was down, and a community outreach program was in jeopardy. The lay leaders suggested an all-night prayer vigil. There were questions, though. Would an all-night prayer vigil in one of Chicago’s roughest neighborhoods be safe? Would they have to hire armed escorts? And what would happen if nobody turned out? There were questions about just how practical a prayer vigil was in the face of a multiple real-life crises. But the night of prayer was scheduled anyway. Yancey says that it was the poorest members of the congregation, senior citizens who lived in a housing project, who were most enthusiastic about the prayer vigil. “I could not help wondering,” Yancey writes, “how many of their prayers had gone unanswered over the years—they lived in the projects, after all, amid crime, poverty, and suffering—yet still they showed a childlike trust” in what God would do through their praying. As we celebrate the birth of Jesus this year, I pray that you are ready to see Jesus and His kingdom in a world that fools itself into believing in only what it can see, control, or manipulate. May your faith be strong! May you look at Christmas without the embellishments the world tries to add to it, instead simply seeing Jesus, the true Son of God and King of kings, and through Him, be filled with His peace. Merry Christmas, everybody! God bless you! As regular readers of this blog know, I read Our Daily Bread as part of my daily devotion time. Most days, really great things appear there and I often share its insights here. But I have to take major exception to today's piece written by Pastor Joe Stowell. He refers to the "peace on earth" proclaimed by the shepherds on the night of Jesus' birth (Luke 2:8-14) and concludes that, in His teaching, Jesus gave us the tools to make peace. This, it seems to me, misses a big part of the New Testament's message. Ephesians 2:14 says of Jesus, "He is our peace." Jesus is the peace proclaimed by the angels that night. Nothing we add to the presence of Jesus in our lives will bring peace. Jesus is all we need for peace--with ourselves, with others, and most importantly, with the God Who made us. All who, in the power of the Holy Spirit, dare to repent of sin and believe in Jesus are filled with God's peace. They are reconciled to God and to others and are called from that time forward to do the admittedly hard work of living in that peace. Peace comes as a gift from God to all who believe in Jesus. Earlier in Ephesians, we're told, "For by grace you have been saved through faith, and this is not your own doing; it is the gift of God--not the result of works, so that no one may boast. For we are what He has made us, created in Christ Jesus for good works, which God prepared beforehand to be our way of life (Ephesians 2:9-10). Peace on earth has come to us in Jesus. We don't manufacture it with the tools Jesus gives, as though Jesus were just another teacher of religion, guru of morality, or a pop psychologist or motivational speaker selling the latest metaphysical wares. Jesus is the Savior, the King of all kings, and God in the flesh. He brings peace. The call of believers in Jesus is simply to walk in the peace God has already created to be our way of life! May our walk with Jesus be filled with His peace, irrespective of the conflicts which may roil this world, and may God use us to bring the peace that comes from believing in and belonging to Jesus to all we meet! Did God Promise a Savior in Genesis 3:15? I will put My enmity between you and the woman, and between your offspring and hers; he will strike your head, and you will strike his heel. What, some folks might have wondered, was Hia talking about? Where is the promise of a Savior? It turns out that Hia is not alone in his understanding of this passage. It has been a traditional teaching among Christians of all theological stripes for centuries. These words were not directly spoken to Adam and Eve, but they were directed distinctly to the serpent himself, and that by way of punishment to him for what he had done. It was a day of cruel triumph to him such joy as his dark mind is capable of had filled him, for had he indulged his malice, and gratified his spite. He had in the worst sense destroyed a part of God's works, he had introduce sin into the new world, he had stamped the human race with his own image, and gained new forces to promote rebellion and to multiply transgression, and therefore he felt that sort of gladness which a fiend can know who bears a hell within him. But now God comes in, takes up the quarrel personally, and causes him to be disgraced on the very battle-field upon which he had gained a temporary success. He tells the dragon that he will undertake to deal with him; this quarrel shall not be between the serpent and man, but between God and the serpent. God saith, in solemn words, "I will put enmity between thee and the woman, between thy seed and her seed," and he promised that there shall rise in fulness of time a champion, who, though he suffer, shall smite in a vital part the power of evil, and bruise the serpent's head. This was the more, it seems to me, a comfortable message of mercy to Adam and Eve, because they would feel sure that the tempter would be punished, and as that punishment would involve blessing for them, the vengeance due to the serpent would be the guarantee of mercy to themselves. Perhaps, however, by thus obliquely giving the promise, the Lord meant to say, "Not for your sakes do I this, O fallen man and woman, nor for the sake of your descendants; but for my own name and honour's sake, that it be not profaned and blasphemed amongst the fallen spirits. I undertake to repair the mischief which has been caused by the tempter, that my name and my glory may not be diminished among the immortal spirits who look down upon the scene." Nor, brethren, must you think it a slender revelation, for, if you attentively consider, it is wonderfully full of meaning. If it had been on my heart to handle it doctrinally this morning, I think I could have shown you that it contains all the gospel. There lie within it, as an oak lies within an acorn, all the great truths which make up the gospel of Christ. Observe that here is the grand mystery of incarnation. Christ is that seed of the woman who is here spoken of; and there is a hint not darkly given as to how that Incarnation would be effected. Jesus was not shadowed of the Holy Ghost, and "the holy thing" which was born of her was as to his humanity the seed of the woman only; as it is written, "Behold a virgin shall conceive and bear a son, and they shall call his name Immanuel." The promise plainly teaches that the deliverer would be born of a woman, and carefully viewed, it also foreshadows the divine method of the Redeemer's conception and birth. So also is the doctrine of the two seeds plainly taught here—"I will put enmity between thee and the woman, between thy seed and her seed." There was evidently to be in the world a seed of the woman on God's side against the serpent, and a seed of the serpent that should always be upon the evil side even as it is unto this day...We see an Abel and a Cain, an Isaac and an Ishmael, a Jacob and an Esau; those that are born after the flesh, being the children of their father the devil, for his works they do, but those that are born again—being born after the Spirit, after the power of the life of Christ, are thus in Christ Jesus the seed of the woman, and contend earnestly against the dragon and his seed. Here, too, the great fact of the sufferings of Christ is clearly foretold—"Thou shalt bruise his heel." Within the compass of those words we find the whole story of our Lord's sorrows from Bethlehem to Calvary. "It shall bruise thy head": there is the breaking of Satan's regal power, there is the clearing away of sin, there is the destruction of death by resurrection, there is the leading of captivity captive in the ascension, there is the victory of truth in the world through the descent of the Spirit, and there is the latter-day glory in which Satan shall be bound, and there is, lastly, the casting of the evil one and all his followers into the lake of fire. The conflict and the conquest are both in the compass of these few fruitful words. They may not have been fully understood by those who first heard them, but to us they are now full of light. The text at first looks like a flint, hard and cold; but sparks fly from it plentifully, for hidden fires of infinite love and grace lie concealed within. Over this promise of a gracious God we ought to rejoice exceedingly. We do not know what our first parents understood by it, but we may be certain that they gathered a great amount of comfort from it They must have understood that they were not then and there to be destroyed, because the Lord had spoken of a "seed." They would argue that it must be needful that Eve should live if there should be a seed from her. They understood, too, that if that seed was to overcome the serpent and bruise his head, it must auger good to themselves: they could not fail to see that there was some great, some mysterious benefit to be conferred upon them by the victory which their seed would achieve over the instigator of their ruin. They went on in faith upon this, and were comforted in travail and in toil, and I doubt not both Adam and his wife in the faith thereof entered into everlasting rest. By the way, the cited paragraphs above are just a fraction of Spurgeon's sermon. People expected long sermons in the nineteenth century and, in Spurgeon's case, liked them that way. If you want to read his entire sermon on Genesis 3:15, go here. The transcribers of the sermon have made something of a mess of Spurgeon's grammar and spelling, but, as one of our contemporary eminent Lutheran preachers, Ed Markquart noted in his book, Quest for Better Preaching, reading Spurgeon is always worthwhile. As an Ohio State alum and fan, I hope that Smith will reconsider that move. The rules are clear: Players are not to exchange goods of any kind, including awards for athletic achievement, team garb, or signed memorabilia, for goods, services, or money. They're to be amateur athletes until, if they're good enough, the NFL drafts them or they're signed to play professional football elsewhere. The suspensions meted out by the NCAA are light penalties, considering that such egregious violations could be seen as warranting revocations of the players' athletic scholarships. One of the notions I've nurtured is that, with his emphasis on character development in his players, Jim Tressel is unique among big-time college coaches. I still think that's true, although like the rest of we members of the human race, he isn't perfect. And he certainly can't be expected to know what happens every moment of every day in the lives of his players. But an appeal of the charitable penalties meted out by the NCAA runs counter to the tone I think Tressel has always worked to foster in the Buckeye football program. I hope that Ohio State will refuse to compound the sadness of this day by appealing. I would expect such a move by USC, Auburn, and other schools, but not by Ohio State. "Christmas...hints at the struggle involved when the Lord of both worlds descends to live by the rules of the one." "What Jesus went on to accomplish on planet Earth made it possible for God someday to resolve all disharmonies in both worlds." Read the whole thing. "Underneath all the bulging bundles..."
But he gives all the more grace; therefore it says, “God opposes the proud, but gives grace to the humble.” 7Submit yourselves therefore to God. Resist the devil, and he will flee from you. 8Draw near to God, and he will draw near to you. Cleanse your hands, you sinners, and purify your hearts, you double-minded. 9Lament and mourn and weep. Let your laughter be turned into mourning and your joy into dejection. 10Humble yourselves before the Lord, and he will exalt you. "Adulterers," I take to be addressed not only to those engaged in adultery, but in all activities that put the world, the self, and other pursuits or relationships ahead of God. Through the prophets in Old Testament times, God described Himself as husband to Israel, condemning His people's penchant for playing the adulteress by worshiping other gods. The New Testament describes the Church as the bride of Christ. So, any time we Christians allow other things to take God's place of absolute ruler over our lives, we are engaging in idolatry--idol worship, or as the Old Testament puts it, adultery. God is bigger than you are. Only God can give you life. And unlike all the other things you might submit to in life, God will help you and love you even when you fall or fail. In Philippians 2:5-11, the apostle Paul gets at much the same message when he cites what most scholars agree must have been a hymn of the early church that reminds us that in calling us to submit to the will of God the Father, we're not being asked to do anything more than Christ did. God "opposes the proud," not because God is an egotist, but because God wants us to live. As I mentioned in another post recently, if the only way for a drowning man to get to shore is to hold onto the lifeguard, you would hardly call the lifeguard arrogant for saying so to the thrashing victim. The God we know in Jesus Christ is that lifeguard. Take it from one willful thrasher to another: Submit to the Lifeguard and you will have real life! Read the Our Daily Bread piece by Anne Cetas. In 1936-37, Americans were in more dire straits financially and for a longer period than Americans of 2008 to present, but they were also more optimistic about the future and, generally, supportive of more federal government intervention in the economy, not less. Both the similarities and differences in Americans' views of government and the economy, as shown in this article from the Pew Research Center, are interesting. What impact do we want our lives to have on others and on eternity? If this morning’s Gospel lesson has given you a bad case of spiritual whiplash, it’s understandable. Last week, on the Second Sunday of Advent, we heard John the Baptist’s confident proclamation of the impending appearance of God’s promised Anointed King—what the Hebrew of the Old Testament calls the Messiah and the Greek of the New Testament calls the Christ. In the coming Christ, John told the crowds who heard him preach in the wilderness, God was getting ready to re-establish His reign over a sinful, rebellious world. When Jesus later showed up to be baptized by John, in a passage not a part of last Sunday’s lesson, John must have felt that all his preaching had been vindicated. Jesus was the Messiah for whom he had been waiting! When we fast forward to the Gospel lesson for this Third Sunday of Advent, we come to a very different scene. Now, if John was like most of the Jews of his day, his expectations would have been that the Messiah, the King of kings, was going to push the bloodthirsty, corrupt Judean kings—the Herodian line—off of their thrones, would save the people from their foreign overlords, the Romans, and would take away the power and prominence the vain and faithless rulers of Judea’s religious life—the priests and teachers of the law. John probably expected a clean sweep of what we would call church and state. And the Messiah, he undoubtedly thought, would make everything in society right. Have the promises of Jesus to hear and answer your prayers sometimes mocked your faith? Have your life circumstances cast your faith in a sovereign, loving God in doubt? Have questions pressed on you as you’ve watched loved ones suffer or die, or you’ve struggled with health issues, financial issues, or when your sense of purpose in life has disappeared? Have you played by God’s rules and watched people who ignore them seem to skate through life as you face troubles and difficulties? The truth, if we’re honest I think, is that we have all been there in the prison of doubt and uncertainty John experienced in that prison cell. Jesus’ response to John’s question in today’s Gospel lesson is not just for John the Baptist, it’s for all of us who have ever doubted, who have wrestled to understand God’s plans in the midst of unbearable pain or indecipherable situations. Go and tell John what you hear and see: the blind receive their sight, the lame walk, the lepers are cleansed, the deaf hear, the dead are raised, and the poor have good news brought to them. And blessed is anyone who takes no offense at me. Jesus didn’t deny that He was the King Who would bring judgment on the unbelieving world. And He would confirm His role as judge of the world many times. In answer to John’s question though, Jesus simply pointed John to all the signs that showed Him to be not just the Messiah, but the Lord of all creation, Who can speak a word and create life where there was death, wholeness where there was brokenness. There’s another message in Jesus’ words, though. It’s this: Change your expectations of the Messiah. Change your expectations of God. I’m not for a moment suggesting that there is any limit to God’s power or to God’s willingness to hear prayers offered in Jesus’ Name. In Jesus, we meet the sovereign, almighty God of the universe Who made us, Who can violate the natural laws He Himself created by performing miracles (and does), Who is committed to bringing injustice to an end, Who will allow those who refuse to trust in Him to go their own ways for eternity, and Who, by His cross and resurrection, has destroyed the power of sin and death for all eternity for those who believe in Christ! Everything that Jesus did, including His sinless life, His sacrificial death, and His rising from the dead, show us Who Jesus is and the good plans God has for those who repent and believe in Jesus. But Jesus’ kingdom hasn’t come in its fullness yet. Right now, you and l live in a world in which bad things happen to faithful people. It can cause us to question, just as it did John the Baptist. The week before she died, Karen, a member of our former parish and a friend of Ann’s and mine, wrestling with her suffering, holding onto Jesus in the midst of it all, confided to me, “I keep wondering what it is God wants me to learn from all of this.” Though deeply faithful—I would say because she was so faithful, because she so believed in Jesus—Karen wondered, as John the Baptist had wondered, when Jesus was going to act decisively. When would God finally act to bring about the promise given by God through the prophet Isaiah and repeated in the New Testament book of Revelation: “He will wipe away every tear from their eyes. Death will be no more; mourning and crying and pain will be no more…”? That promise will come to pass. The God Who has never broken a promise will make it happen. The God Who was born in a stable, lived among us, died for us, and rose to give us life can be counted on to make things right. Every day we live in this world is an opportunity to do exactly what Jesus invited John to do: To look to Jesus; to see what He has done and understand the compassionate, powerful God Who has done incredible things for His people…Who is still doing them. If we’re inclined to see Jesus as a hedge against the nasty realities of life, a cosmic Santa Claus who makes life just go away, we need to change our expectations. As was true for Jesus, before our resurrections, there will be challenges to face, hurdles to overcome, crosses to bear. Today, Jesus invites you and me to seize the days we have, one by one, and to live this life fully: to turn from sin, to live for Jesus, and, just like Jesus, to spread His love by what we do and who we are. And when, like John the Baptist, we wrestle with our questions, Jesus calls us to focus our hopes on Him, and not anyone or anything else. While we await the return of the Messiah Who came to our world on the first Christmas, we can live in this uncertain and sometimes sad world with the absolute certainty that Jesus will make all His promises good for all who trust in Him. When we let that certainty fill us, we can face everything with joy and peace, the very blessings of which the angels sang on the night of Jesus’ birth. Here's a video featuring the incomparable Carolyn Arends, singing her song, 'Seize the Day.' Arends' music was important to Karen, the woman mentioned in the sermon. We played Arends' song, 'All is Well,' during Karen's funeral in 1999. I'll say something I never thought I would say: Go, Blue! A great story from the school up north and the courageous journey of a young man from Wauseon, Ohio, just a few miles from where my family and I lived for six years. You will not regret watching this feature from the Big Ten Network. By the way, did you notice the passage of Scripture on the back of one of Brock's t-shirts? "God is love." God revealed this central truth about Himself in both Old and New Testament times. It's why 1 John 4:8 says, "Whoever does not love does not know God, for God is love." So, would a loving God ever describe His human children with names like wicked, fools, or stupid? As Dave Branon points out in this piece, the loving God of the universe Who ultimately disclosed Himself in the crucified and risen Jesus, has used these names for some people. I hope that you'll read Branon's piece, especially if your notions about what the Bible means in saying that "God is love," has created a false image of God as an indulgent grandparent who doesn't care how we defile ourselves, hurt others, or dishonor Him. Take it from someone who has done lots of wicked, stupid, and foolish things, for which God still calls me out each day, if God didn't love you, He wouldn't call you out for sins or willful ignorance of His will. It's when God calls us out and we dare to hear what His Word tells us about His will for human beings, that we can exercise the gift of repentance and experience a fuller relationship with Christ. Two other passages of Scripture come to mind as I think about the tough and tender love of God that loves you just as you are, but loves you too much to leave you there. Do not be like a horse or mule, without understanding, whose temper must be curbed with bit and bridle, else it will not stay near you. If we say we have no sin, we deceive ourselves and the truth is not in us. If we confess our sins, he who is faithful and just will forgive us our sins and cleanse us from all unrighteousness. If we say we have not sinned, we make him a liar, and his word is not in us. God's enduring will for the human race is laid out clearly for us in what scholars call the Mosaic Law, the Ten Commandments, here. Unlike Old Testament ritual and civil laws, the Ten Commandments are valid for all time. They're well interpreted for us in 1 Timothy 1:8-10. It's wicked, foolish, and stupid for us to willfully flout the law of God because doing so separates us from Him and His desire to be with us forever. But when we confess our sins--when we acknowledge that God is right in calling us out for our sin--and seek and accept the forgiveness God freely offers in Jesus Christ, God not only forgives us, God also gives us the power of the Holy Spirit to resist our inborn inclinations to sin. Asia Bibi is the Pakistani Christian convicted of blasphemy and sentenced to death for her faith. Tomorrow, at the Pakistani consulate in New York, Pakistani Christians who live in the US will stage a protest on her behalf. Please pray that God will give them--and Bibi--favor and that this mother of five, the victim of persecution, will avoid the death sentence and be set free. Thank God that sinners are saved not by what they do, because we could never do enough to merit forgiveness or new life from God. We're saved only by what God has done for us in Christ and our God-created trust in Christ. The charge, apostasy, is not even a crime under the Iranian penal code. Pray that he will be set free. For more information, go to the story of Pastor Nadarkhani on the site of the International Campaign for Human Rights in Iran. Go here to contact the Iranian delegation to the United Nations in order to ask the Iranian government to encourage confidence in Iranian justice by releasing a man sentenced to death for something that isn't even illegal in Iran. He was part of the best infield of all-time and one of the best Shortstops of all-time. The guy was money in the playoffs, batting a career .297, batting over .300 in 4 of his 9 series. Let’s look at his career numbers. 2326 hits (good enough for #130 on the all-time list). While that may not look so impressive, here’s some players he has more hits than: Jim Bottomley, Eddie Mathews, Bobby Wallace, Kirby Puckett, Kiki Culyer, Joe Cronin, Mike Schmidt, Willie Stargell, Joe DiMaggio and Willie McCovey. These aren’t cupcake, shrub-type names. These are ALL Hall-of-Famers, and some are recognizable household names. He has more hits than Joe DiMaggio, one of the most iconic figures in baseball history. When you compare him to similar players, www.baseball-reference.com lists Bobby Wallace, Pee Wee Reese & Luis Aparicio (all Hall-of-Famers), Alan Trammell (still on the ballot and should be a Hall-of-Famer), Edgar Renteria (a man who definitely has a case) & Tony Fernandez (one of the best Shortstops of his era). 5 Gold Gloves at Shortstop. Only 68 people have won 5 or more Gold Gloves at the same position. People with more Gold Gloves than Concepcion at Short? Ozzie Smith (Hall-of-Famer), Omar Vizquel (hopefully future Hall-of-Famer), Luis Aparicio (Hall-of-Famer), Mark Belanger (offense not really strong enough to make the Hall-of-Fame) & Derek Jeter (future Hall-of-Famer). And what does it say that a guy played in 2488 games, good enough for #54 on the All-Time list? What about 8723 At Bats (good enough for #85)? A guy showing up and doing his job? A guy like that screams Hall-of-Fame to me. 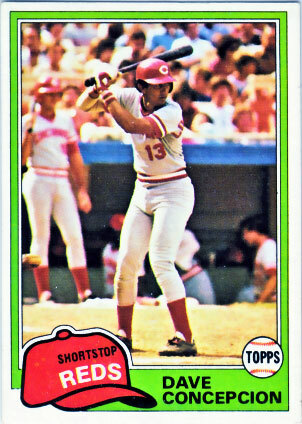 While it's not a no-brainer decision, I believe that Concepcion, who taught a generation of shortstops how to play their position on artificial turf and was certainly the best shortstop in the 1970s with the greatest National League team of all time, deserves to be in the Baseball Hall of Fame. Here are Concepcion's lifetime stats. This quote is included in a wonderful book that I'm using both for my devotions and my weekly sermon prep. If you're like me, this short piece from Pastor Deb Grant will make you chuckle...then wince...in self-recognition. Religious Leaders Affirm Marriage as "permanent...faithful union of one man and one woman"
Christian leaders, including the Bishop of the newly-formed North American Lutheran Church, the president of the Lutheran Church-Missouri Synod, and leaders of Roman Catholics, Orthodox and Anglican Christians, as well as of evangelical church bodies, have affirmed marriage as "the permanent and faithful union of one man and one woman." There are also signatories from Mormonism, Judaism, and the Sikhs. Marriage is the permanent and faithful union of one man and one woman. As such, marriage is the natural basis of the family. Marriage is an institution fundamental to the well-being of all of society, not just religious communities. As religious leaders across different faith communities, we join together and affirm our shared commitment to promote and protect marriage as the union of one man and one woman. We honor the unique love between husbands and wives; the indispensible place of fathers and mothers; and the corresponding rights and dignity of all children. Marriage thus defined is a great good in itself, and it also serves the good of others and society in innumerable ways. The preservation of the unique meaning of marriage is not a special or limited interest but serves the good of all. Therefore, we invite and encourage all people, both within and beyond our faith communities, to stand with us in promoting and protecting marriage as the union of one man and one woman. Rev. Frederick J. Moury Jr.
A Possible New Year's Resolution?